Following the invention of the steam engine, demand for coal rocketed throughout Britain. 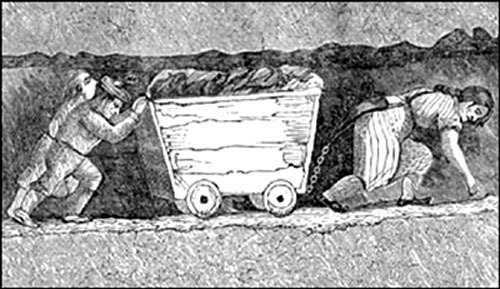 Although the use of coal did exist before the industrial revolution this tended to be on small scale operations and it was from mines near to the surface. Industrialisation brought advancements in technology and a combination of inventions and the influx of factories increased the demand significantly. Over a two hundred year period the rise in mining rose by astronomical rates from approximately 2.54 million tonnes in 1700 up to 224 million tonnes in 1900. Britain was part of a coal mining boom. Coal mining became prominent within peoples minds at the end of the sixteenth century as it was beginning to become apparent that there was a shortage across Britain in wood and water yet coal and iron was available in abundance. London led the way in both accepting there was a shortage of wood as a fuel and also seeing coal as a viable alternative. Coal was abundant in many regions; particularly the North and the advancements in transport infrastructure enabled this to reach areas of the greatest demand. This advancement in transport subsequently linked the North with London helping with economic growth significantly. This demand for coal was both domestic for heating supplies as well as industry which required the conversion of coal to coke; a process similar to the traditional conversion of wood to charcoal. This demand for fuel sparked the industrialisation of the coal mines across Britain over the space of 200 years. Traditionally mines were operated on small scale focusing on coal near the service however as the demand increased as did the need to find more coal. Mines therefore began to get deeper. As they began to get deeper they were flooded with groundwater which made working conditions difficult. The coal was cut by hand with a pick-axe. Sometimes miners worked in seams no higher than 75cm’s and would struggle day to day with posture due to these working conditions. There was no rest up for children neither. Those as young as five worked as ‘trappers’. This job involved the opening and closing of airtight trap doors to make sure fresh air circulated around the mine. The long term physical damage of mine work was evident. Women & young girls were expected to carry baskets of coal up to 150 kilos on their backs, dealing with the conditions within the mines including surface water and confined spaces. Given these mines were hundreds of feet deep they had to deal with flooding on a daily basis. The mines also had explosive gas commonly known as fire damp which was more prominent the deeper the mines were. It only took something as simple as a spark from a miners pick axe. The dangers also came from those who managed the mines. Conditions were exceptionally tough and people were expected to work long hours without breaks. Pregnant women were expected to work right up to the birth of children and babies born within the mine surroundings wasn’t uncommon. The demand for the supplies and the financial rewards meant that people were the victims of industrialisation. The increase in tonnes of coal shipped over 200 years was as a result of hard work for those involved within the mines day to day. Unfortunately the dangers of the mine environments sometimes resulted in deaths for those workers. The sheer demand and the fact the mines were hundreds of feet deep meant accidents did happen and this usually resulted in the loss of lives of workers throughout the country. The book ‘All About the Industrial Revolution’ by Peter Hepplewhite details some of the deaths within two key years of the industrial revolution within the mining environment. Horse-Ways – These were the main passages where horses would be used for hauling large quantities of coal. Some of the mines throughout the country used a pulley system to wind up the trams. Level – A Level is a tunnel into ground which slopes similar to a cave. The coal within ‘levels’ was mined without having to dig a shaft. Hurriers – This was a job given to specific people who moved the coal from the face (where it was initially mined) to the horses-ways where it would be transported to the exit of the mine. Many coal mines suffered disasters when flames from lamps caused gas called fire-damp to explode. Safety lamps began to be introduced as technology and inventions advanced. These were said to have saved thousands of lives in the process.